Hi y'all!! Wow I can't believe it's been almost a week since I posted last... I can honestly say that I did miss y'all and typing up these recipes, however it was a much needed break to take care of my sick boys (and the big one was monopolizing the computer while he was home sick anyway... haha!) and to take care of myself so that I wouldn't get sick. And believe it or not, I never did catch it! I had a few days of horrible allergies after being out on the farm, but that's normal for me!! YAY!!! Now, on to the recipe. 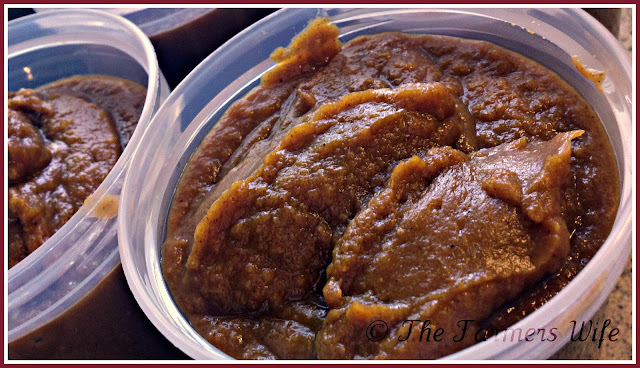 I've been toying with the idea of making Pumpkin Butter for about a year. I thought about it last Holiday Season, but ran out of time and energy. This year I decided to go nuts, in 2 days time I made a giant batch of this stuff, a batch of Cran-Apple Butter and 2 homemade loaves of bread... Yeah I went a little crazy... haha! This recipe will fill 6 16 oz. containers... I know I know.... That's a little much. But I gave most of this away, and that is my plan for the future to make this for holiday gatherings, or to just give away to friends and family! Plus this amazing butter can be used for baking too, and I'll be sharing my recipe for Pumpkin Spice Donuts later this week! I confess I'm doing something I rarely do right now... I'm posting the recipe to make the big batch. Why you might ask? Because I want to, lol! And because if it was me, all the ingredients for this are really reasonable so why not share with those you love? (Plus you can't use it in baking if you don't make more than you need.... haha!) I hope y'all love this, it really makes your house smell like fall! This was amazingly simple and took very little time, and yet it tastes like a pumpkin pie spread on your favorite bread... It's amazing! I give this 4.5 stars. This Pumpkin Butter is gorgeous and speaks of Fall with all the flavors of the pumpkin and those spices, Yum. I may not make the full recipe, but I'll be making this soon. Thanks for the shout out on Facebook about my guest post tomorrow on The Country Cook. Glad that you didn't catch the bug, too. I wish I could scoop up some of that pumpkin butter through my computer monitor... it looks so good! Hope your boys feel better. Your pumpkin butter looks scrumptious. We always make apple butter in the fall, but I think it's time to branch out. Thanks! Sounds delicious! Question: Why can we not can pumpkin butter? "When cooked down into a butter, pumpkin flesh becomes quite dense, making it difficult for the heat produced in a canner to penetrate fully through the contents of the jar. This means that even in a pressure canner, the interior of the jar may not reach the 240 degrees needed to kill those pesky botulism spores." Hope that helps! You can keep it in the fridge for up to a month or so, and in the freezer much longer! I can't wait to roast my fall pumpkin decorations and try this recipe! Is there anything better than toast and pumpkin butter? Then again, is there anything better than a spoon and pumpkin butter! ?